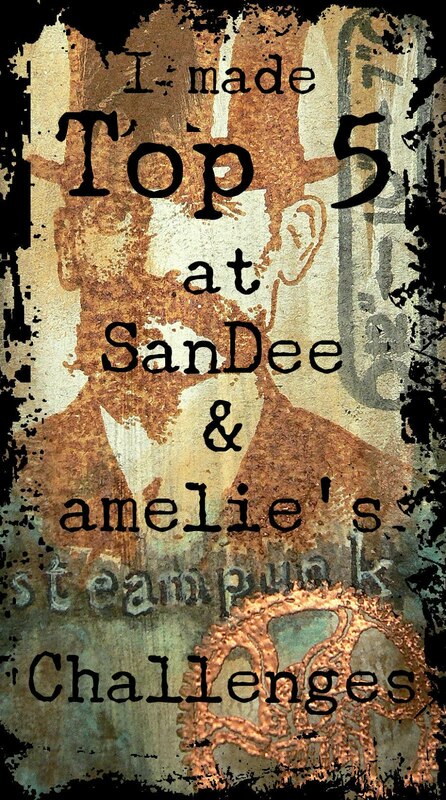 Hi, servus and welcome to the first of our new mid-month posts here at SanDee&amelie's Steampunk Challenges! 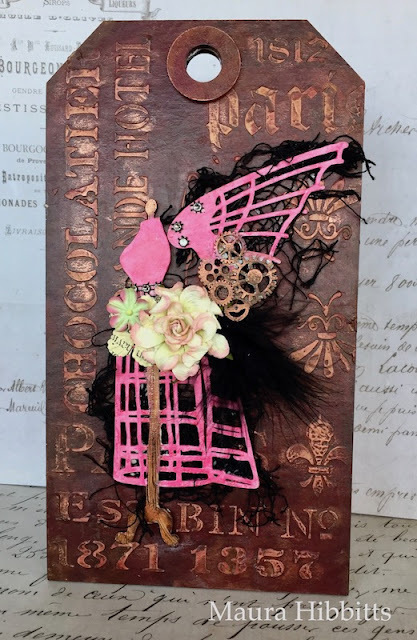 I have decided for now to combine the announcement of our Top5 and prize winners from the previous month with the second round up of inspirational makes for the actual challenge. 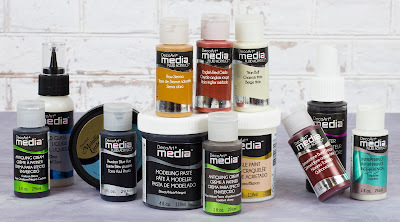 I am currently thinking on making some changes to the way of doing our challenge and Top5 and prize winner posts, so it gets easier for me to run the blog (as I am not feeling my very best and haven't done so for quite some time now). I want to keep this challenge blog up and running (for our players and myself) - maybe it just needs some tweaking here and there to make it more joyful again and less of a challenge (hahah, pun intended). So, please, be patient, if you find I have been adding changes again! 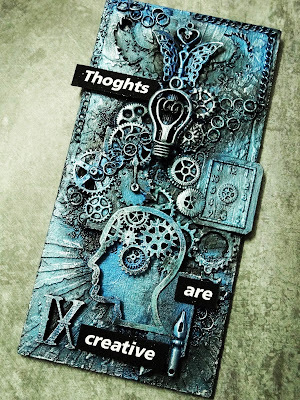 so you're all free to have fun and happily create away! Please, check our challenge rules ("Da Rules") for some recent updates, if you haven't already. (you'll find these on top of the blog page - right below the banner). Thank you! The linkup tool to enter your projects to can be found at the bottom of this post or with the challenge post from the 1st of the month. 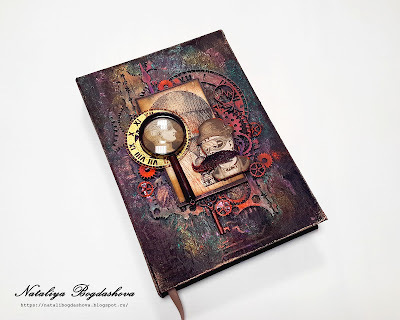 or a surprise steampunk chipboard package sponsored by lovely Glenda - aka boozybear! 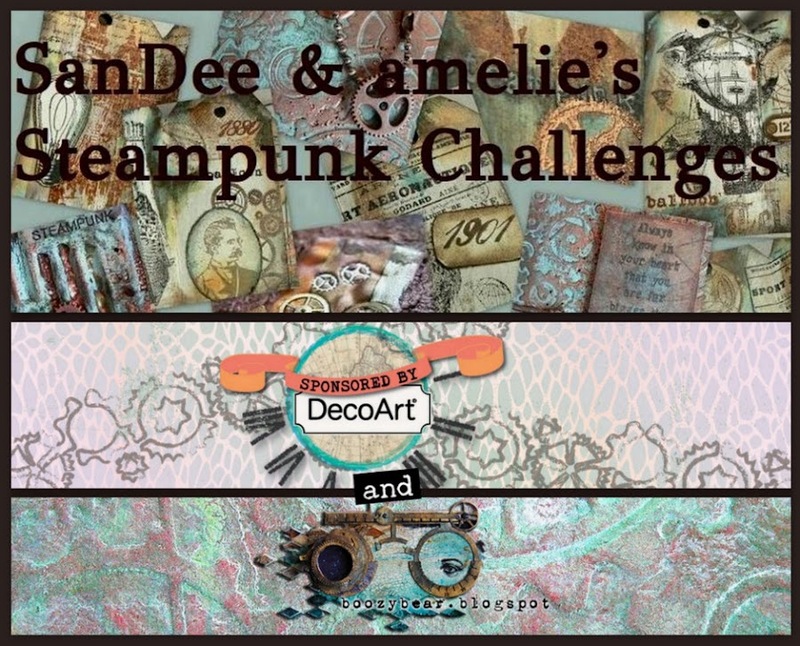 All you have to do to win, is play along and have a little steampunk/industrial fun! once in a while. This time she wanted to create with fabric. And she turned "a very simple cotton bag into a very special cotton bag. to create my SteamPink Lady." If you want to learn more about the projects and the how-tos or simply take a closer look at details, simply hop over to the teamies' blogs (by clicking their names). If you want to make them very happy, please, leave a short comment so they know you've been visiting. Also don't forget to check out the makes of Team A if you haven't done so already! Thank you! 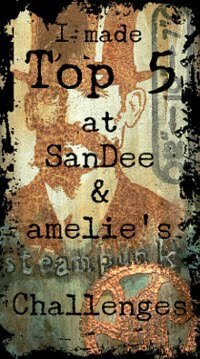 Now on to our Top 5 and prize winners from the January challenge! "thinking in- and outside the box"
Huge congrats, ladies! So very well done! Please, feel free to grab the badge for display on your blogs! Congrats on your prize wins, Linda and Barbara! Please, contact me via email (see sidebar), so I can have your goodies sent to your places! 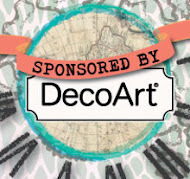 DecoArt will need a phone number for shipping as well, Linda, so, please, add that to your shipping data as well. 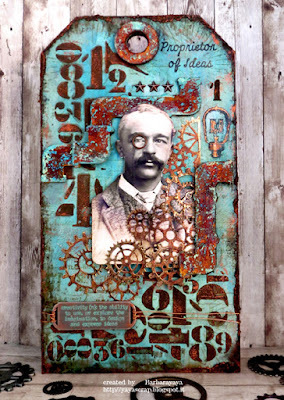 Servus, hi and welcome back for another challenge with once more loads of steampunk and industrial style fun and beauty! 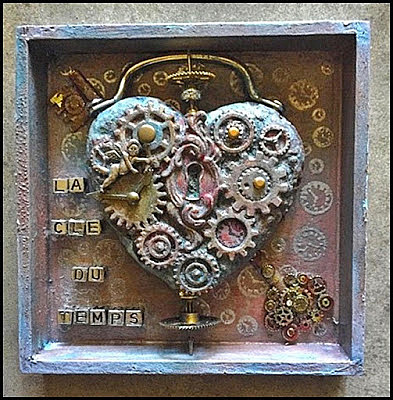 ....or a surprise steampunk chipboard package from amazingly talented chipboard designer and artist Glenda aka boozybear! 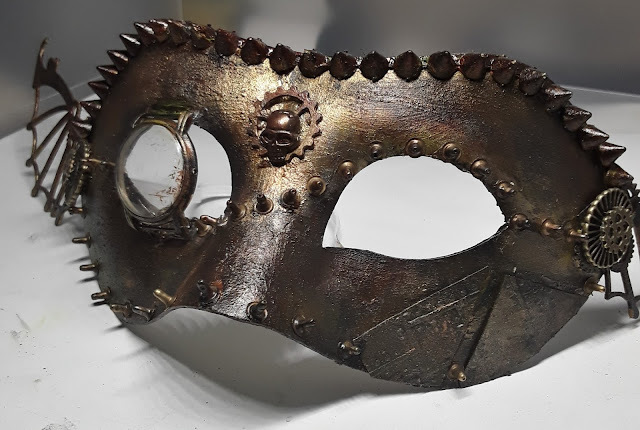 All you have to do to get the chance to win one of these, is follow our few rules and share some creative steampunk fun with us. But now on to the makes of Team A! Here we go! - perfect for February and the famous Cologne Carnival. 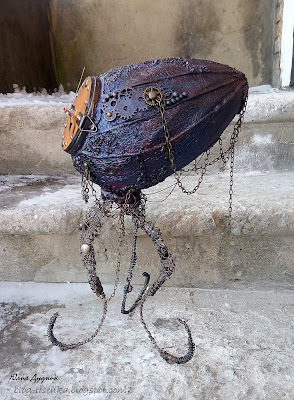 Look at those wings and the monocle! I love this to bits! 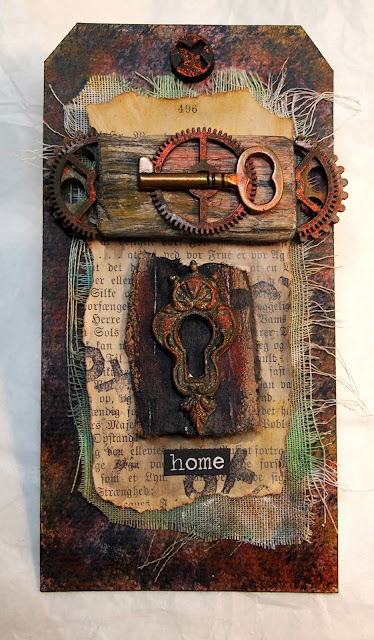 And she's achieved such a beautiful metal look with the DecoArt products, hasn't she? 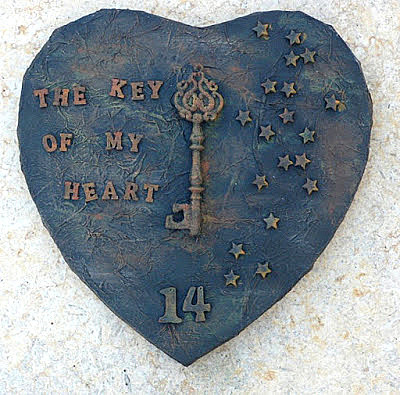 "the key of time that opens the lovers' hearts"
made a steampunk panel from heavy cardboard. 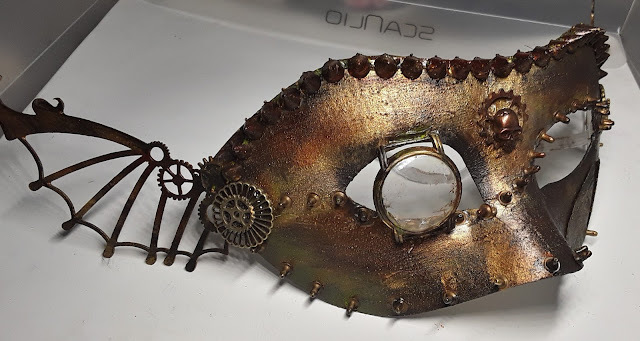 "I think I'll use it as a cover, but now it's still just good as a painting"
the rusty tag and elements! If you want to make my team happy, please, hop over to their blogs (by clicking on their names) and leave a short comment there. You'll also find more images and info about the projects there. Our challenge is open until the end of the month and can be entered via the inlinkz tool at the bottom of this post. I can't wait to see what you create! And don't forget to return on the 15th for more inspiration and the announcement of the January prize winners and Top5. See you then!